ASTANA, March 19./TASS/. Kazakh President Nursultan Nazarbayev had a telephone conversation on Tuesday with Russian President Vladimir Putin, discussing with the Russian leader his decision to step down on March 20, the press service of the Kazakh leader reports. 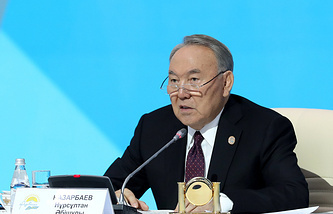 "The heads of state spoke about the decision of President of the Republic of Kazakhstan Nursultan Nazarbayev to step down from office from March 20, 2019," the report said. The press service said the presidents had agreed to continue regular contacts in the future. On Tuesday, Nazarbayev said he would step down as the head of state. He also signed a decree appointing Senate Speaker Kassym-Jomart Tokayev as Kazakhstan’s Acting President. Nazarbayev said he would remain chairman of the Central Asian state’s Security Council despite his resignation. Nazarbayev, 78, will also remain chairman of the Nur Otan Democratic People’s Party and a member of the Constitutional Council. Nazarbayev has led Kazakhstan since 1989, when it was part of the Soviet Union. In 1990, Nazarbayev was elected as the nation’s first president.